Who Doesn't Want This Bucket of McDonald's McNuggets and Fried Cheese? Sure, McDonald's might want you to think it can offer semi-healthy food options instead of its typical burgers and fries, but one of the company's newest -- and more gluttonous -- menu items appears to embrace its greasy, deep-fried history. It's literally a big tub of fried chicken and cheese. 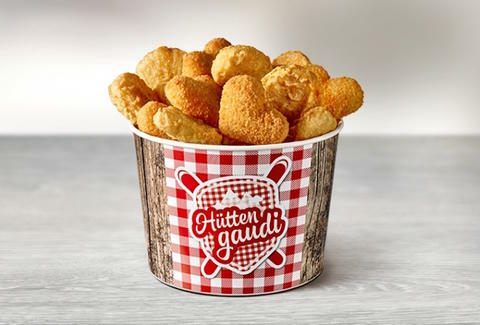 As reported by Burger Business, the global fast food chain's Austrian restaurants are serving what's called the "McDonald's Schmankerl Mix," which is German for "tons of calories" (not true). Actually, it's a KFC-style cardboard bucket filled with 15 Chicken McNuggets, 10 fried Emmentaler cheese puffs shaped like hearts (because everyone <3s cheese? ), and a choice of four sauces. Totaling nearly 1,500 calories and a whopping 80g of fat, this thing shouldn't be eaten alone or in one sitting, but that doesn't make it any less tempting. Luckily/sadly/frustratingly/ugh, the mini barrel of cholesterol isn't available here in the US, and appears to be exclusive to Austria. So besides the obvious questions like "What the hell is a Schmankerl?" and "Are heart-shaped fried cheese balls a cruel joke? ", the bucket further fuels the question of, "Why in the world does McDonald's release the best stuff in other countries?" Tony Merevick is Cities News Editor at Thrillist and is intrigued by the aforementioned fried cheese, because he loves cheese. Send news tips to news@thrillist.com and follow him on Twitter @tonymerevick.